With permission, Sciblogs is re-publishing some of the blog posts here, including Mary Sewell’s thoughts on eorsion and sediment impacts on waterways, shared below. Opito Bay on the Coromandel Peninsula is a special place to me – where I spent idyllic childhood summers, swimming, diving, exploring, hut-building – and with important experiences that led to my career as a marine biologist today. The Stewart Stream in the middle of the bay was an important location for our adventures; you could travel up it in a small boat or kayak, you could play in the lagoon where it met the beach at its end and for some, this was where you went “fishing”, first off the bridge and then on the purpose-built fishing platform. There are stories of people catching huge eels and I, myself, have seen koura (freshwater crayfish), small fish and eels in the clearer headwaters of the stream. 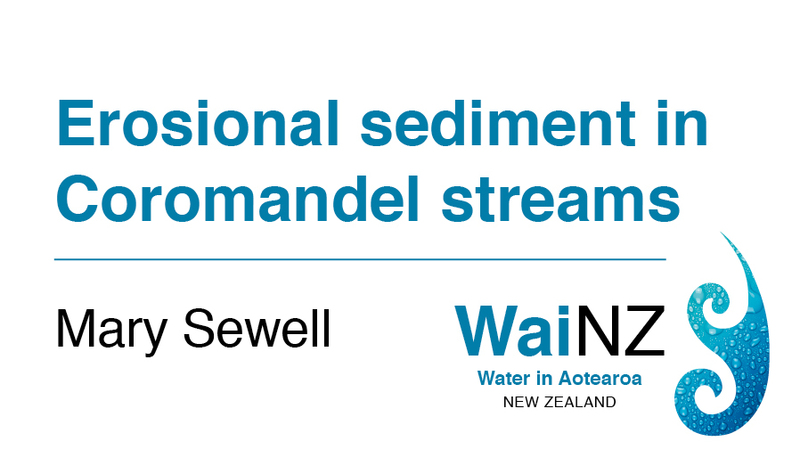 While recent attention has focused on nutrients and bacterial contamination in New Zealand’s rivers, there is a hidden danger present in many of our streams – sediment washing into our waterways through soil erosion. Every stream naturally includes some form of sediment, but if the sediment levels get too high, then there is a cascade of effects on the stream – sediment can block the light so that algae cannot grow, can smother stream invertebrates which are an important food source for fish, can damage fish gills, and the decreased water clarity makes it more difficult for fish to move around and find their prey. Scientists usually measure the effects of sediment on streams using a measure of turbidity (how cloudy the water is), and the % dissolved oxygen (if this is too low, then larger organisms such as fish may die). One might think that the Stewart Stream, whose catchment is primarily exotic or native forest, might show good water quality. 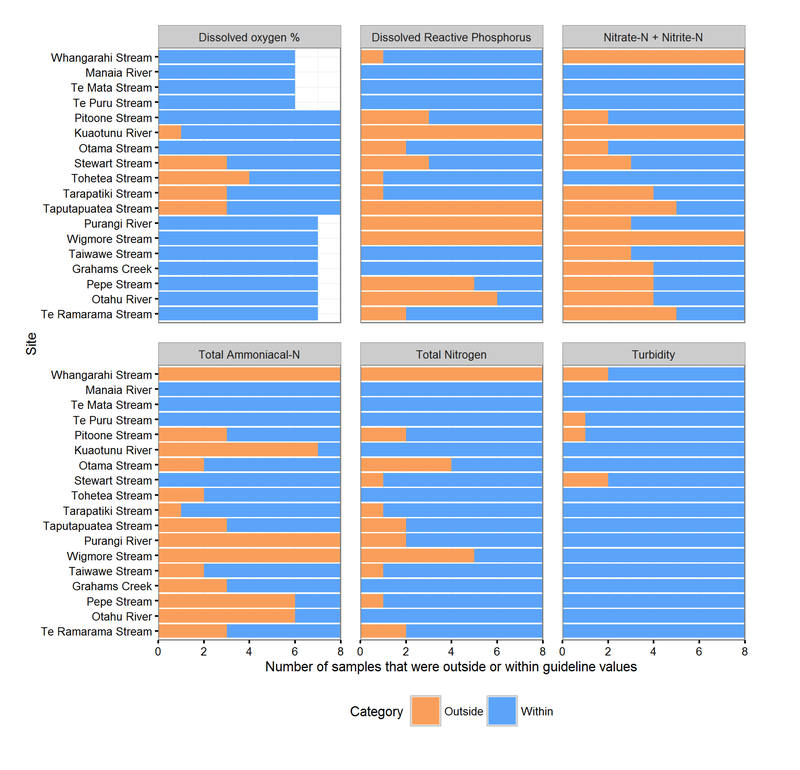 However, recent sampling by the Waikato Regional Council shows that at the stream mouth it exceeds ecological health guidelines in 5 of the 6 water quality measures in samples taken in January and February 2015 (see figure below). In addition, faecal contamination from cows, humans, possums and gulls exceeded the guideline values half of the time, especially after periods of heavy rainfall. Some of this contamination will come from the drystock farm in the lower part of the catchment (which to its credit has fully-fenced the border with the stream), but some will also come from the septic tanks of holiday homes near the beach. In report-speak, this means that there is “an elevated risk of swimming at this location about half of the time”. Let us focus, however, on the turbidity and dissolved oxygen levels. In general, the water is clear (below the guideline on 6/8 samples), but when it rains a large amount of sediment from the catchment runs into the stream (turbidity guideline exceeded, and there is a lowering of dissolved oxygen). In the period since Jan/Feb 2015, when the Waikato Regional Council took these samples, the forestry block that borders the stream on the western side has been logged, and there is now significant wood debris and sediment from logging activities in the stream. 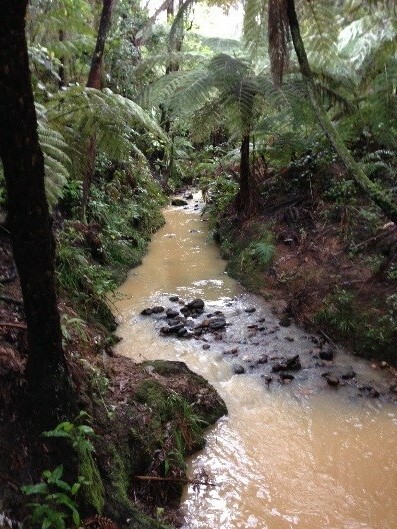 Removal of the pine trees and the native undergrowth has exposed the underlying clay soil, so that every time there is significant rainfall the stream clarity drops dramatically. I did not have the instruments needed to measure turbidity or dissolved oxygen on my recent walk but, as shown in this photo (taken on 2 September 2017), the stream is carrying a lot of sediment and I imagine the invertebrates and fish living in here would be under some stress. After long periods of rainfall, this discoloured sediment forms a huge plume where the Stewart Stream meets Opito Bay. This is New Zealand and the rain will continue to fall, and at times there will be lots of erosional sediment washed into our streams. 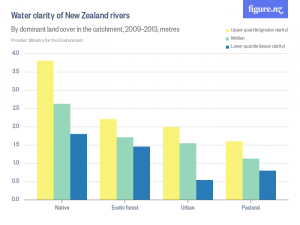 In a time of climate change, where rainfall is expected to be more intense, we need to more carefully consider the impact of what is happening in the catchment on our rivers and streams. Just as for our farms, where riparian plantings of native vegetation are used as a means to decrease nutrient runoff into our streams, perhaps it is time for our forestry blocks, whether in private or public hands, to consider a riparian zone of native vegetation, that gives a buffer for our streams from erosional run-off. Waikato Regional Council Technical Report (2016/17). Snapshot of coastal stream mouth water quality in the Coromandel area (January/February 2015). Mary A. Sewell is a Professor in the School of Biological Sciences at the University of Auckland. She studies the impacts of the environment on reproduction and development in marine invertebrates. Increasingly, her research also covers the impacts of anthropogenic effects, such as climate change and freshwater run-off, on coastal marine systems.